Probably one of the most discussed topics about popular Hollywood cinema is that of horror genre. Horror fans are the most loyal and devoted group of cinema aficionados, who spend enormous time and efforts on digging up the most arcane facts of their favorite films. 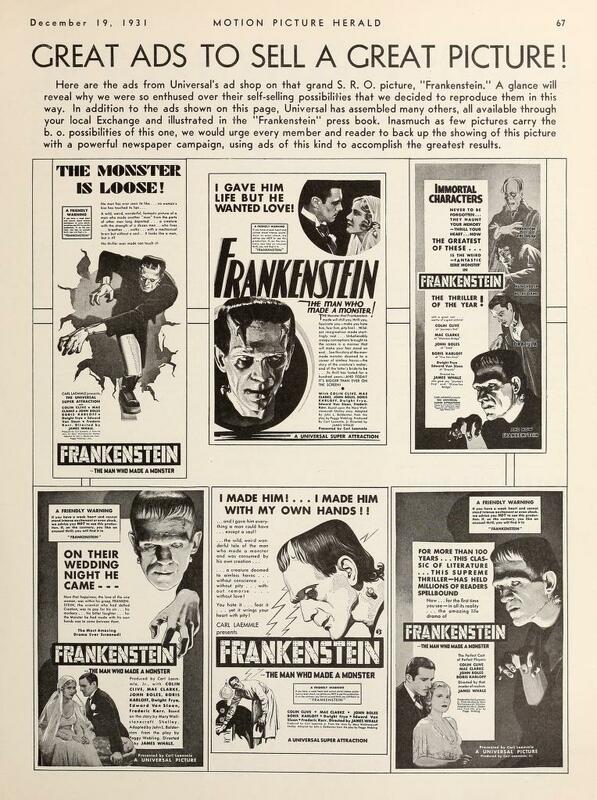 Above all, Universal horror films are the most researched and discussed topics of all and, of course, “Frankenstein” and its sequels fascinate all of us to this day. As I was preparing for the Japanese magazine article (in preparation), I read many of these treatises, writings and publications of extensive research and discussions. They are excellent and just interesting to read. Plus I did my own research myself, and some of my findings don’t seem to have appeared in any of recent discussions on the topic, as far as I know. So I will share some of them. They are nothing ground-breaking or anything, just a few bits of trivia you might find interesting if you are familiar with Universal’s Frankenstein series. 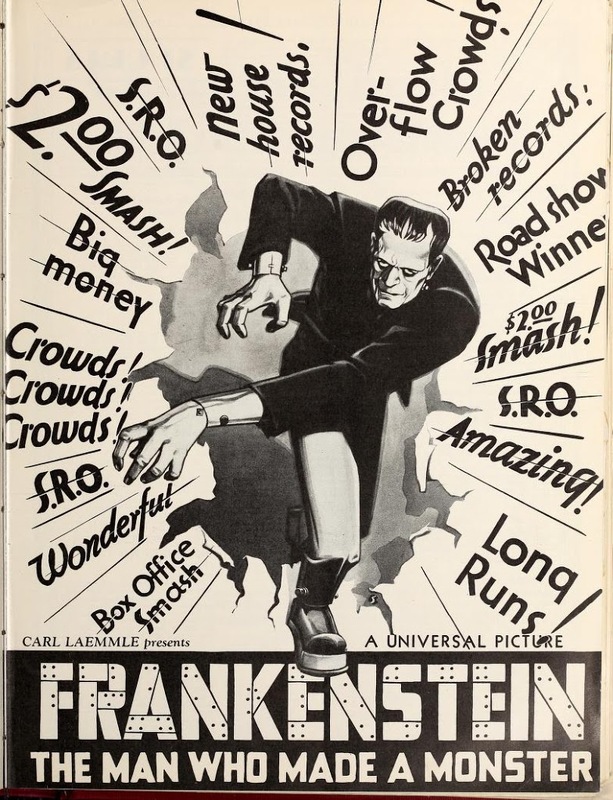 The preview screening for “Frankenstein” caused a great pain on Carl Laemmle Jr. stomach. It was held on October 29, 1931, at the Granada Theater in Santa Barbara. According to James Curtis (“James Whale, A New World of Gods and Monsters”), the audience reaction appeared anything but enthusiastic. Laemmle Jr. panicked and ordered reworking of the film for the release. However, Eddie Montagne, ex-Universal man now at Paramount, persuaded him otherwise, assuring the preview response “Frankenstein” experienced did not indicate the immediate doom. Laemmle Jr. decided not to go on rampage and settled on some minor changes. So we have the version of the original Frankenstein as it is now today. The reaction of the preview audience might not have been the results of the film itself. It may well have been the heat. The weather in Santa Barbara that day was an odd one. According to the National Climatic Data Center, Santa Barbara experienced unusual high temperatures during the last week of October in 1931. Particularly, on October 29, the day of the preview, mercury in the glass tube hit as high as 36 degree C (roughly 97 F) during the daytime. It must have cooled down after the sunset, but no data on that. Maybe audience were exhausted from heat. They might have just needed fresh cool air. “Frankenstein” is a thriller, make no mistake. Women come out trembling, men exhausted. I don’t know what it might do to children, but I know I wouldn’t want my kids to see it. And I won’t forgive Junior Laemmle or James Whale for permitting the Monster to drown a little girl before my very eyes. That job should come out before the picture is released. It is too dreadfully brutal, no matter what the story calls for. It carries gruesomeness and cruelty just a little beyond reason or necessity. The film was categorized as “drama” in the headline. It is easily understandable that the ‘horror’ genre was yet to be recognized widely, even though quite a few films of that nature had been released by then, including Universal’s own “Dracula (1931)”. This article appeared before the general release (the reviewer had seen the preview at Hollywood), and that infamous scene of the girl drowning was already a ‘sensation’. Chicago – A new movie machine called the Polygraph, a variation of the lie-detector, demonstrated Wednesday in the projection room of the Universal Film exchange during the showing of “Frankenstein”, has Film Row agog. The machine acts as a check on the emotions of a motion picture audience, recording accurately every thrill felt by the subjects, according to Phil Reisman. The test was supervised by Col. Calvin H. Goddard and Dr. Leonard Keeler of the Crime Detection Laboratory of Northwestern University. The machine records the psychogalvanic reflex of the person to whom it is applied. Leonarde Keeler is the “father” of Polygraph, the Lie Detector. While he was in UC Berkeley and later in UCLA, he developed an instrument to record subject’s response under (criminal) interrogation. It is reported that his first handmade polygraph ‘solved’ a murder case in 1924. Since then, he had been obsessed with perfecting the technique of lie detection. In 1930, Keeler moved to Chicago with his police friends, August Vollmer and John Larson. Keeler joined the Crime Detection Laboratory of Northwestern University, the nation’s first forensic laboratory. Chicago was the capital of the organized crime, and the lab was founded in response to St. Valentine Day Massacre. It seems little odd to see such a device in a movie projection room, but it goes to show that people saw this movie as a ‘possible trigger’ for dark hidden feelings. There is no report of the result of measurements, though. This article is from April 30, 1935, upon the release of “Bride of Frankenstein”. Kansas City, April 29. – The perversity of human nature is demonstrated here in this week at the Tower where “The Bride of Frankenstein” is drawing an unusually heavy child attendance. The picture is proving to be a family attraction, and Barney Joffee, manager, is at loss to explain, inasmuch as his ads stressed it is “not for the young, the scary or the nervous”. Reviewers on local papers also pointed out the picture is not suitable for children, but over the week-end many parents brought their families. Joffee decided he would not refuse admission to children since, he said, measures taken with the previous “Frankenstein” picture and other horror films, such as age limitations and the sale of only adult admissions, have proved to be subterfuges and parents cannot be prevented from bringing their children. As we all know, kids who watch too many horror movies would grow up to be violent criminals. So it is damn important to make sure they don’t watch “Dracula”, “Frankenstein” or “Bride of Frankenstein” on TCM. Now, Mr. Barney Joffee miserably failed to stop irresponsible parents to bring their small children to his theater. I don’t want to know what might have become of them, but Mr. Joffee must have been horrified to see these children back in his theater many years later, now grown up, watching “Ghost of Frankenstein” or “House of Frankenstein” and even more horrifying “Abbott and Costello Meet Frankenstein”.